In recognition of the designs and performance of diverse products including FUJIFILM GFX 50S, Medium-format mirrorless digital camera and FUJIFILM X-T2 the mirrorless digital camera. FUJIFILM Corporation (President: Kenji Sukeno) is proud to announce that its 17 major products, including the compact and lightweight medium-format mirrorless digital camera “FUJIFILM GFX 50S,” carrying a large image sensor, have won the Red Dot Design Award 2017, a product design award program organized by Design Zentrum Nordrhein Westfalen based in Essen, Germany. Fujifilm has won the Red Dot Design Award for five consecutive years since 2013 with its products, including the X Series of digital cameras, praised by professional photographers and photography enthusiasts for their outstanding image quality, excellent operability and premium design. This year, 17 products, the highest record for Fujifilm, have won the honor in recognition of their innovative product concepts that address leading-edge user needs, excellent performance, advanced technologies that enable the performance, and premium product designs. The Red Dot Design Award is an international product design award launched in 1955. It examines products released within the past two years, and they are judged in nine criteria including degree of innovation, functionality, ergonomics, ecological compatiblity and durability. It is among the world’s most prestigious design award, along with the “iF design award” in Germany and the “International Design Excellence Awards (IDEA)” in the United States of America. The X-A10 is a compact and lightweight mirrorless digital camera with an APS-C sensor, designed in pursuit of outstanding operability. Its rear LCD, which can be rotated 180 degrees, makes it easy to take self portraits. The thin camera body with a built-in flash has all dials and operation buttons on the grip side to enable a quick one-hand operation for added operability. The camera can shoot approx. 410 frames on single battery charge. It is a perfect camera for entry-level users, delivering high quality images at ease in any shooting conditions. The XF100-400mm F4.5-5.6 R LM OIS WR is an interchangeable ultra-telephoto zoom lens for the X Series of digital cameras, covering the focal lengths equivalent to 152mm-609mm in the 35mm film format. The compact and lightweight body features the best-in-class** five-stop*** image stabilization system. The use of rubber focus / zoom rings and easy-to-operate switches makes it possible to take pictures hand-held even in the ultra telephoto range. Advanced image quality, synonymous to the X Series, can be enjoyed when shooting a fast-moving subject, such as an airplane and motor sports. The application of fluorine coating on the front lens element and weather-sealing on the lens body means the lens is resistant to dust, moisture and low temperatures down to 10 degrees Celsius below zero. It can be taken outdoors in various weather conditions. The XF35mm F2 R WR is a standard focal-length prime lens in FUJINON’s compact, lightweight and stylish series of lenses. The fast f2.0 lens with the focal length equivalent to 53mm in the 35mm film format, delivers fast autofocus performance for ease of use despite its compact and lightweight form factor, weighing just 170g. Metal parts are used on the outside for added durability and quality feel. The weather- and dust-resistant structure that withstands temperatures as low as -10 degrees Celsius means the lens can be used in a variety of shooting scenes including outdoors. The aperture ring with just the right amount of feel and other features enable a fast and intuitive operation. The lens’s standard angle of view, which provides a natural perspective, similar to that of the human eye, as well as its compact and lightweight form factor, make it an ideal lens for snapshots and portraiture. It is available in black and silver for extra enjoyment with mirrorless digital camera photography. The XF23mm F2 R WR is a versatile wide-angle prime lens in FUJINON’s compact, lightweight and stylish series of lenses. The fast f2.0 lens with the focal length equivalent to 35mm in the 35mm film format, delivers fast autofocus performance for ease of use despite its compact and lightweight form factor, weighing just 180g. Metal parts are used on the outside for added durability and quality feel. The weather- and dust-resistant structure that withstands temperatures as low as -10 degrees Celsius means the lens can be used in a variety of shooting scenes including outdoors. The aperture ring with just the right amount of feel and other features enable a fast and intuitive operation. The lens’s wide angle of view as well as its compact and lightweight form factor, make it suitable for a wide range of genres, including landscape and snapshots. It is available in black and silver for extra enjoyment with mirrorless digital camera photography. The UA13x4.5 is a portable wide-angle broadcast zoom lens that boasts resolution exceeding 4K, high contrast and high dynamic range. It supports shooting at the ultra-wide-angle focal length of 4.5mm and the minimum working distance of 0.3m. The use of ultra-high-precision large-diameter aspherical lens minimizes distortion and compromised peripheral resolution, typically found in ultra wide angle shooting, while enabling high-resolution recording across its zoom range. When capturing landscape or sports for example, the lens addresses the needs to shoot dynamic and highest-quality video in ultra wide angle or close-up. The telephoto end covers up to 59mm in focal length, making it a perfect lens for a variety of situations, such as indoor / outdoor video production and news coverage. The FUJINON HF-12M is the top-of-the-range series of machine vision lenses for use in product inspections and measurements at production lines. The Series offers high-performance prime lenses that are compatible with 2/3-inch sensors with 2.7μm pixel pitch*5 (equivalent to 8MP) and boast the world’s smallest*6 and most lightweight*7 form factor. The series’ “4D High Resolution*8 ” feature, which mitigates resolution degradation associated with the change of working distance or aperture value, provides edge-to-edge sharpness across the frame under a diverse range of settings and shooting conditions. There are five models of different focal lengths available, so that users can choose the optimum lens for their applications. *5 Pixel pitch is an indicator of sensor’s image definition capability. The unit “μm” represents the distance between adjacent pixels. The smaller the number is (i.e. higher pixel density), the higher the image definition becomes. 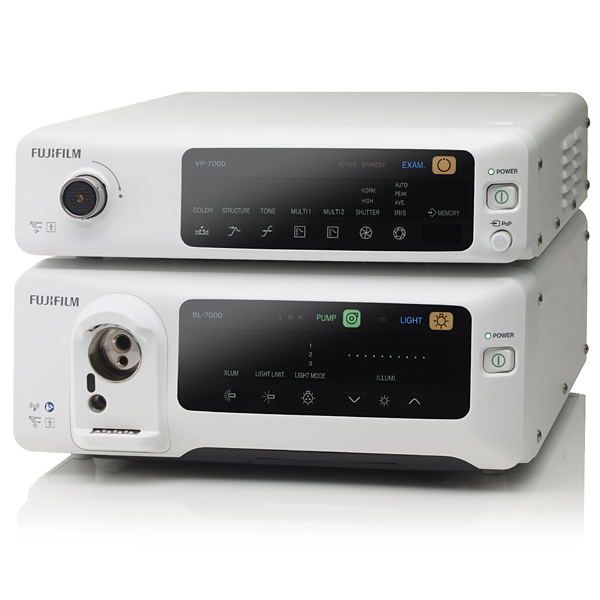 The SP900 / CP900 / RS900 make up an ultrasonic probe system for fiberscopes. The system inserts an ultrasound-emitting probe from fiberscope’s forceps channel*9 to enable ultrasound examination using endoscope. The system consists of the ultrasonic probe (SP-900), control pad (CP-900) and scanner (RS-900), and is used in combination with a light source and a processor. The SP-900’s display panel, CP-900’s operation section and RS-900’s probe connector are all designed in black to aid easy visual recognition during preparation and probing stages. For setting-up efficiency, the SP-900 has a slim-line design, and the CP-900 offers a compact form factor. 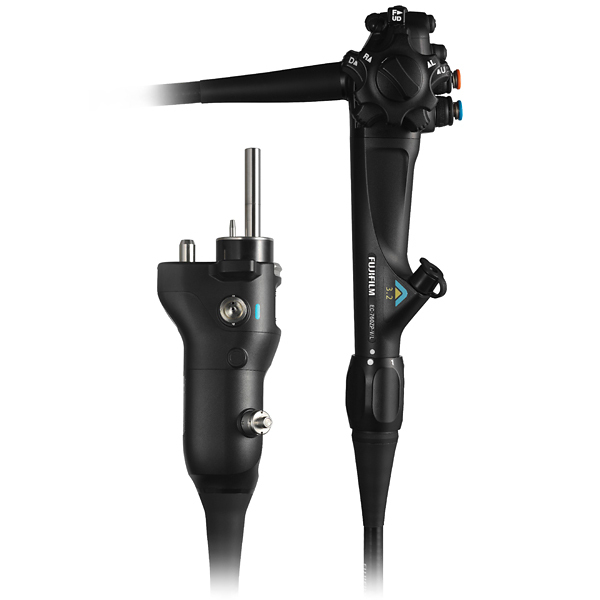 The RS-900 is an arm-hanging type so that it is easy to adjust the probe’s cable height. The SP-900 is beautifully designed with rounded edges, while the CP-900 uses flat surfaces with minimum protrusions. These design features are for ease of cleaning, and also intended to minimize patients’ concern or fear that could arise from the devices’ appearance. *9 Opening for inserting a tool, etc. It’s an electronic endoscopy system to diagnose digestive parts. Utilizing feature of high-luminosity LED, we loaded “narrow-band observation (BLI)” which display mucosa and vessel with high contrast. Visibility for lesions as cancer is improved. Using a new scope, it enable smooth start having no connection for electric supply and communication. The electrode-less connecter becomes less corrosive and highly reliable in durability/cleanliness. The console with LED indication on black ground is the icon which provides good visibility to both operator and staff. We designed it as round form for easy cleaning and reduction of patients’ anxiety. It’s an electronic endoscopy to diagnose digestive parts. Operation part was improved with tests. Optimizing shapes of parts/layout and making easy handling of angle knob/button/lever, it reduced stress of operator by high grip performance. Using new material on insertion part, it realized Advanced Force Transmission which enables tip move freely. Connection to illuminant/processor without connecting to electric supply/communication enables smooth start. The electrode-less connecter becomes less corrosive and highly reliable in durability/cleanliness. Using code color of instrument channel diameter as grip indication, it avoids human error.